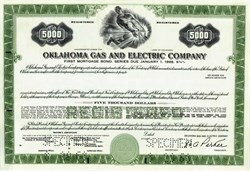 Beautifully engraved specimen certificate from the Oklahoma Gas and Electric printed in 1968. This historic document was printed by the Federated Banknote Company and has an ornate border around it with a vignette of a man holding the company's logo over a lightning bolt. This item has the printed signatures of the Company's officers. Oklahoma Gas & Electric (OG+E) is a regulated electric utility company that serves over 750,000 customers in Oklahoma and western Arkansas. OGE Energy Corp. (NYSE: OGE), with headquarters in downtown Oklahoma City, is the parent company of Oklahoma Gas and Electric Company, a regulated electric utility, and Enogex Inc., a natural gas pipeline business. OGE Energy and its subsidiaries have about 3,100 employees. OG&E Electric Services serves approximately 754,840 customers in Oklahoma and western Arkansas, and a number of wholesale customers throughout the region. OG&E, with nine power plants capable of producing about 6,100 megawatts, generates about 70% of its electricity from low-sulfur Wyoming coal and 30 percent from natural gas. OG&E also has roughly 170 megawatts of wind power. Under the plan announced on October 29, 2007, President and CEO Peter Delaney announced that wind power could be increased to about 770 MW. OG&E is the largest electric utility in the state of Oklahoma. The company delivers all of its electricity across an interconnected transmission and distribution system spanning 30,000 square miles (78,000 km2). Enogex is engaged in natural gas gathering, processing, transportation, storage and marketing. Enogex operates a natural gas pipeline system with about 8,000 miles (13,000 km) of pipe, six processing plants, and 23 billion cubic feet (650�106 m3) of gas storage capacity, principally in Oklahoma.